Indispensable wherever the sun shines, the sun defensers are mandatory. There are some great formulas available now on the market that target the UVA (cancer causing) and UVB rays, in diferent spectrums and textures, and the ones that made it to the round up responded to basic requirements: undetectable, non-greasy, fast absorbing, efficent. Don't forget that a sunblocker is our days must-have anti ager. Carefully read the list of ingredients and choose the formula right for you. Always remember: SPF indicates the number of minutes you can stay in the sun without burning, the formulation with chemical ingredients needs at least 20 minutes to be absorbed, and sprays should be applied two inches from the skin. Aesop Protective Body Lotion SPF50 provides up to eighty minutes water resistance and contains ingredients rich in Vitamin E to provide skin-nourishing benefits. La Prairie' s Ultra Protection Stick Eye • Lip • Nose, is a must-have no matter the weather. People usually neglect their eyes, ears, lips and nose, very sensitive face areas, but this particular product has UV filters able to create a protective barrier and traps moisture within the skin. The Beach Defense Sunscreen Spray Broad Spectrum SPF 30 from the go-to Neutrogena (this brand has a huge range of suncare products) provides UVA and UVB sun protection in a lightweight, fast absorbing mist, it is oil free, PABA free, ideal for outdoor and water resistant for 80 minutes. The high-end label La Mer, does not even need an introduction. Just keep in mind that its innovative Broad Spectrum SPF 30 UV Protecting Fluid helps to prevent the appearance of future discolorations while providing UVA/UVB protection. The rest is pure indulgence. With its SPF 40 broad spectrum factor, the Super City Block Oil-Free Daily Face Protector from Clinique is the ideal sunscreen, even for the ones with a more sensitive skin. It protects against sun and environmental damage with broad-spectrum UVA/UVB sun block and antioxidants. It can be used alone or as an invisible makeup primer. If you are like me and prefer to stay away from any unwanted shadows that a straw hat can leave on your face after a day in the sun, or dry ends caused by the sea water, you should invest in a high-quality hair product. The one that always delivers is Moroccanoil Treatment Original from Moroccanoil. This cult product is infused with antioxidant-rich argan oil, strengthening proteins and shine-boosting vitamins to offer each time smooth, manageable and nourished hair. 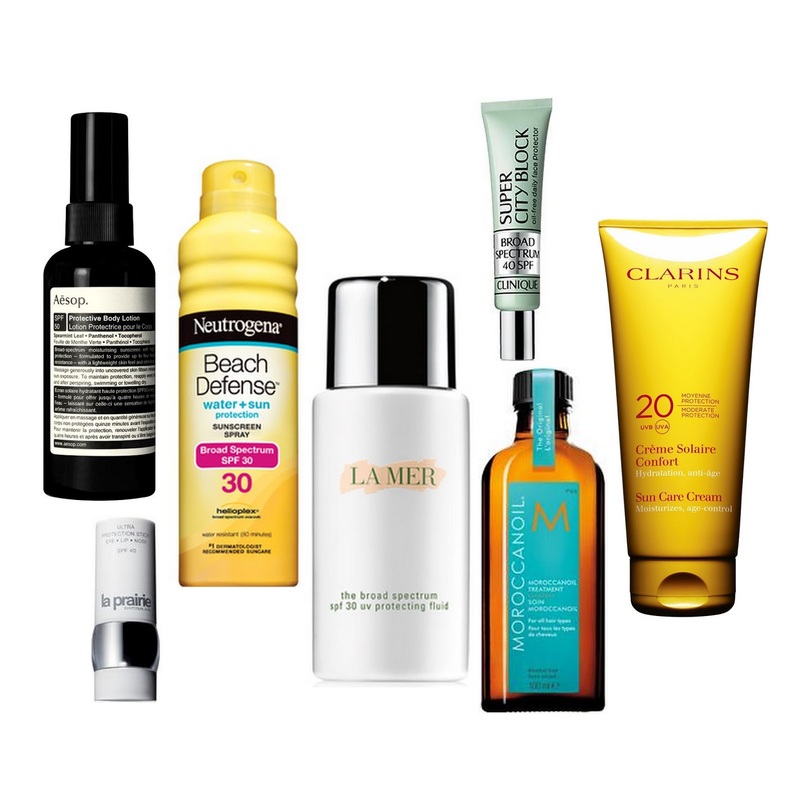 Sun Care Cream from Clarins, is another favorite. It offers UVA and UVB protection, hydrates to perfection and is also perfect to use if you have a more sensitive skin.